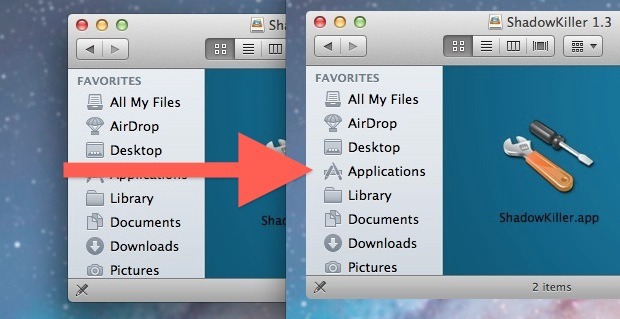 Ever wanted to remove shadows from windows, menus, and box items in Mac OS X? You can with a free tool called ShadowKiller, and it works in newish versions of OS X too. All you need to do is launch the app, the screen will flicker briefly, and all on screen windows will appear shadowless. You can get the shadows back by just relaunching the app again. If you want to have the window shadows always disabled, you’ll need to throw ShadowKiller into Login Items. Why would you want to do this? At this point it’s probably a matter of preference, but Shadowkiller was created to speed up performance of Mac OS X on older and slower hardware, and it reportedly works fairly well for that purpose. Frankly, leaving window and box shadows enabled looks much better, so unless you have a compelling reason to do so, you’ll probably want to keep them around. Remember this disables the window and menu shadows all the time, not exclusively in screen captures. For the latter, you can disable the shadow in screenshots only with a defaults write command or by using Grab or the Terminal to take a one-off screenshot minus the 3D look. Nice little find by Jeff Bearnam, who reminds us that yes the app works despite Unsanity’s warning that it isn’t compatible with newer versions of OS X. Anyone know of a program that will allow for controlling the thickness of the shadows? I don’t want to kill them off completely but, I do not like the default level of thickness in Lion. If there was a way to bring the shadow level down that would be ideal. That would be great, but I do not think it’s possible because the shadows are probably drawn by sprites. Maybe replacing the sprite could reduce the shadow thickness. YES!! I actually want MOAR SHADOW!! yes now we are talking. i also want moar shadows. Why? Why you posting this useless tips?? And what do you recommend instead? Steve Jobs is taking harp lessons on a cloud. Stop projecting your infantile notions onto others immediately. When programming I tile windows so that I have one application on the left and one on the right. With shadows enabled, it’s distracting having much of the content cast into the shadow of the other window. Probably there is a way to eliminate shadows from the command line, and thus does not involve installing software. I never “got” shadows. there’s no light or sun creating them… do they serve a purpose other than aesthetics? I don’t mind them, but when I think of them, I find them silly. This tip is not useless. Its actually very useful for speeding up older Macs. I actually knew about the app before but didn’t think it would work beyond Leopard (thats what Unsanity’s website said). I have a bunch of older Core Duo Macs that could use this speed tweak. Thanks for sharing and confirming it works on the newer versions of OSX! People with certain eye conditions have trouble with bright backgrounds (especially on old display hardware), and find it better to switch to “white on black” in System Preferences / Universal Access. In this inverted mode, shadows appear as bright glows around windows and are positively annoying. I’m glad there’s a way to remove them; they should really be removed by default when in white-on-black mode.